Candidates applying to the CRCC post must not exceed the upper age of 45 Years and must not be below 18 years as reckoned on 01-08-2018. 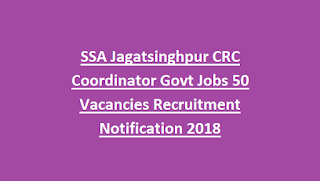 Candidates contending for the Post of CRCC must be a competent Elementary Cadre Teacher (Level-IV & V) and must have at least 10 years of experience in teaching experience. Applicants who have successfully submitted their candidateship within the stipulated date will be assessed on the basis of Written Test based on syllabus as per the educational standards required for the post followed by Visioning Test & Group Discussion. 6. Where does the candidate see the school in next 5 years? 7. His/Her achievements during the service. 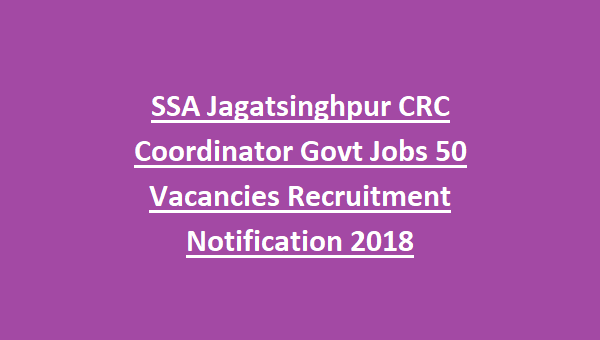 Candidates seeking possession under SSA Jagatsinghpur CRC Coordinator Jobs Recruitment 2018 can refer the official notification.